Great Barracuda live in tropical areas all around the world. When they are small they tend to live in shallow bays and other nearshore areas. As they get larger they tend to move out to reefs and wrecks farther offshore. You can often see them as they sit near the top of the water like logs. They are blindingly fast over short distances and cut their prey in half with their mouth full of jagged teeth. They grow to around 100lbs. The biggest one I have personally seen caught was around 45lbs and my best one was a little below that. Barracuda are usually caught when fishing for something else. Their sharp teeth often bite through line if you are not using wire. In some places they are not regarded as a prized catch, but I have always liked them because it's always fun to catch something with a wicked mouth full of teeth. They make quick runs but do not have a lot of stamina when hooked. They sometimes jump, especially the larger ones. On a recent trip to Florida it seemed that every reef spot we went to had at least a couple of them. They would follow every other fish we hooked while trying to decide whether to eat it. 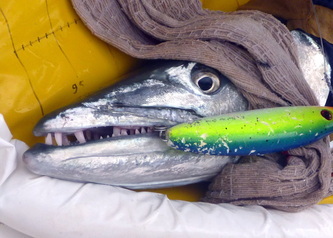 They took some bites out of some Bonita and cut a Kingfish in half right next to the boat, creating a big cloud of blood and a sad looking Kingfish. It added some extra excitement to the day. I have never eaten one. In some places the larger ones over around 30 inches or so carry ciguatera toxin. They have a strong unpleasant smell when lifted out of the water and I generally release them unless someone else wants one. They are pretty slimy as well. Obviously you want to take great care when handling them as their bite could result in hard-to-remove blood stains on your clothes. I would recommend a medium weight saltwater conventional setup rated 20-30lbs or so. You could also use saltwater spinning gear. If you are fishing lures you would use a longer rod in the 7’+ length, and if you are fishing with bait you could get away with a slightly shorter rod. If you are trolling you can use a very short rod if you want. You don't need a lot of specialized tackle to catch these guys. The ideal setup would probably be a Shimano Trinidad reel or if you wanted to go with spinning gear a Daiwa Saltiga reel paired with a nice Calstar rod. If you are targeting Great Barracuda specifically you probably want to use a wire leader to avoid getting cut off by their teeth. Barracuda are readily caught with both baits and lures. They are curious fish and will usually come over to have a look at anything that enters their territory. If they decide not to bite a lure the first time they rarely bite the second time so you might as well move on or try something different. They may congregate for short periods for spawning or other reasons but are generally seen by themselves, especially the very large ones. Great Barracuda readily bite a number of different lures, usually if they are fished quickly and erratically. I have caught them on trolled plugs, casted and retrieved jerkbaits, and trolled rubber skirts. Whatever you use, make sure it can withstand the fish’s teeth. 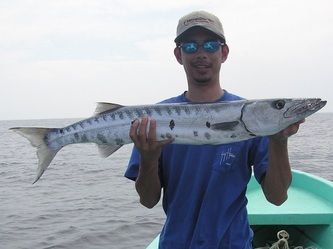 If I were targeting Great Barracuda specifically with lures I would probably get a 5”-7” plug like a Yo-Zuri Crystal Minnow or a Rapala X-Rap in a shiny color and cast and retrieve it erratically while working along the edge of any tropical reef. I have never targeted them specifically but have caught quite a few while doing this for other species. If you want to be lazy you can troll these lures behind the boat. Twitching them erratically now and again should usually work better than just straight trolling. In some places they have great success fishing with lures made of a strip of surgical tubing but I have never caught one using those. Because Great Barracuda often bite the tail, you may be able to get away with not using a wire leader if fishing with a lure with rear hooks. However, don't use any lures that you are super attached to if you do this. Most silvery bait fish like mackerel, small bonita, sardines, etc should work. You can either cast them to likely spots or slow troll them behind the boat. Barracuda often bite the tail off first and then come back for the rest later, so don’t pull the bait away too early if they do that. Some people like to use a single hook through the nose and a treble hook in the tail to prevent getting bitten off too much. 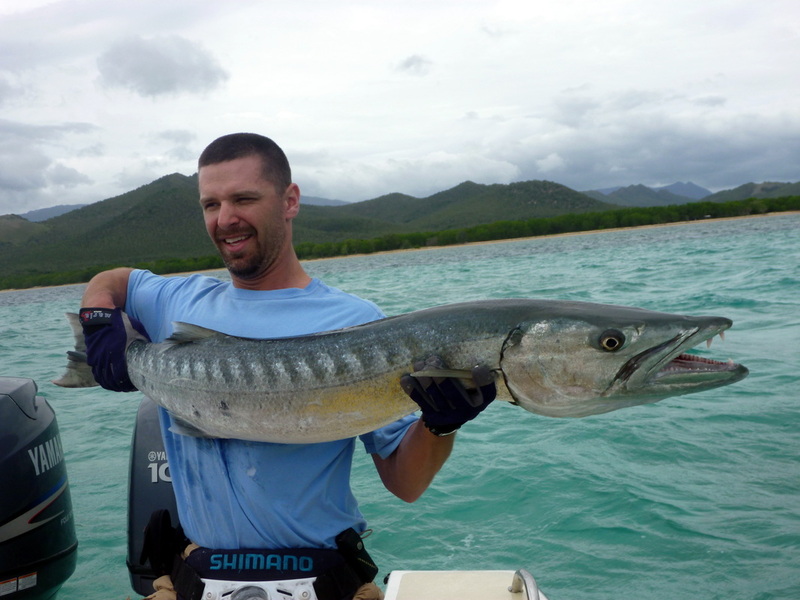 Barracuda have very good eyesight so don’t use hooks that are too large. Wire will decrease your bite offs but also decrease your bites. If you want to tempt fate and retie a lot you can uses straight fluorocarbon with a circle hook and just hope the circle catches in the corner of the mouth before it bites through. However, a wire leader is probably the safer way to go. Any reef system in the Southern Pacific should have some nice ones. Ditto for the Carribean. The biggest ones I have seen pictures of were caught in Africa. Basically if you fish a lot in the tropics you will catch some whether you are trying to or not. Great Barracuda caught off Bayahibe, Dominican Republic. Great Barracuda caught off the Great Barrier Reef, Australia on a sinking Sebile Stick Shad.